Are your current chemicals not cleaning as well as you would like? Does it take longer with more effort to get the job done? Are you experiencing lower profits due to overpaying for chemical that doesn't do a quick job- costing you more labor? If so, you need Steel Eagle high quality chemicals. 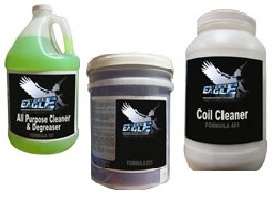 No matter what you plan to clean we have a Steel Eagle chemical that can save you time and money! Give them a try- the proof is in the power!